The dollar hit fresh lows against the euro in late trading on Wednesday on speculation Russia could increase its reserves of the single currency. The US currency's new fall follows recent sharp declines on worries about the yawning US trade gap. What is seen as a lack of will among US policymakers to halt the decline has seen the dollar plumb new lows against many other major currencies. Against the euro the dollar hit $1.3179 in New York. 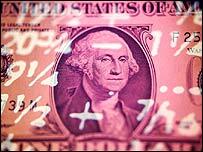 The Greenback also fell to a near five year low against the Japanese yen, at 102.54 yen, before rallying slightly. The greenback is now trading at nine-year lows against a basket of foreign currencies. "Scaremongers are now touting a US dollar armageddon... with little to halt the appreciation of the euro," said Matthew Foster-Smith, currency analyst with IFR Forex Watch. Meanwhile, speculation was growing that the Federal Reserve may intervene to stem the dollar's slide. "With markets thin over Thanksgiving , you can't rule (intervention) out," said Elizabeth Miller, an analyst at Redtower Research. Fears that the US wants to see its currency weaken to ease its massive current account deficit have been a driving force behind the dollar's recent decline. Fuel was added to the fire last Friday after Federal Reserve chairman Alan Greenspan said the current account gap was unsustainable. He also added that foreigners might lose their appetite for dollar assets, given the size of the US deficit. Meanwhile, last weekend's meeting of the Group of 20 finance ministers failed to signal a policy response to the greenback's decline, giving extra impetus to dollar bears. The latest sell-off began on Tuesday afternoon after Russia's central bank said the bank was reviewing its forex reserves "with the highest priority". Though euros already account for 25% to 30% of Russia's reserves, commentators believe it is hungry for more. The recent bounce-back in oil prices also served to weaken the US currency, analysts said. US light crude futures briefly pitched above $50 per barrel on Tuesday. The dollar's relentless tumble shows no sign of abating. According to analysts at Capital Economics, the greenback could have a lot further to fall unless the current account deficit is reduced to a sustainable level. Policymakers are trying to quash US consumers' thirst for buying imports as one way of solving the current account crisis. However, Capital Economics argued, it is unlikely that a weakened currency will be enough to cure the problem alone. US consumers need to start saving, it claims, which will end up slowing consumer spending growth. And as Europeans are unlikely to be happy that their export-driven industries are bearing the brunt of the dollar's dive, some economists fear that something unforeseen could trigger an even deeper crisis. "You never know what beat from a butterfly's wing will send this thing into oblivion," said David Gilmore of Foreign Exchange Analytics. "I'd say the people selling dollar's are speculators," said Marc Chandler of Terra Capital Partners. "We need to keep this in perspective. We are not seeing wholesale capital flight from the United States."